One of the industry’s latest advances in the screen world is “Retractable Screens”. Sometimes you seek ventilation and pest protection, but don’t necessarily need a storm door with both screens & glass inserts. Beckett Glass is a dealer for ClearView Retractable Screen Doors. American made and considered the finest in the industry. Available in 11 powder coat finishes and custom made to fit your door opening. 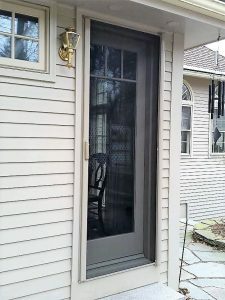 The ClearView product is the only high quality retractable screen that enjoys the feature of their patented “speed reducer” allowing the door to open (retract) in a more measured manner without the slamming back so commonly found with other retractable door products. Single doors, pair setups, popular sizes and of course custom sizes are all welcome. Stop in our store to see a full size sample, check out the manufacturer’s website or check out some great examples in our gallery. In addition to ClearView’s manual, horizontal retractable door line, Beckett Glass is also a proud dealer for Universal Motion Screens. This is the larger, electric motorized screen system that allows you to convert your open air patio or porch to become a screen porch at the push of a button on your wireless remote. Available with mesh choices and 7 standard colors. Please visit the manufacturer’s website or our gallery to see some great examples on how to create new high tech living space without the uninvited and annoying pests.